The Entrust Entelligence Messaging Server is an appliance-based gateway that delivers standards-based e-mail encryption capabilities. This comprehensive e-mail security solution includes hardware, operating system, supporting applications and ongoing online updates. 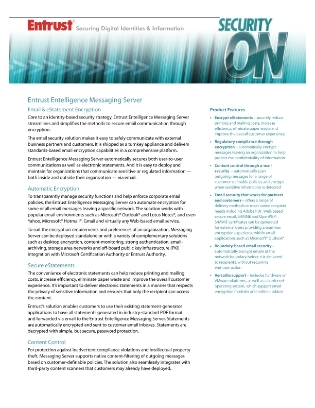 To suit the encryption requirements and preferences of an organization, Messaging Server can be deployed standalone or with a variety of complementary solutions such as desktop encryption, content monitoring, versatile authentication, e-mail archiving, storage area networks and off-board public key infrastructure (PKI) integration with Microsoft Certification Authority or Entrust Authority.